Over the course of two weeks, more than 100,000 of you came to our Facebook page and voted for your favorite people, places and things in this city. And now that winners have been officially announced via our latest print edition (you can pick up a copy at any of the 500 locations listed here), we will be rolling out all 30 winners online–one a day for the next month. Though not affiliated with any particular school, the Junior Roller Derby of Long Beach is this season meeting once a week at the Queen Mary Dome to give lasses ages 7 to 17 a chance to have fun, make friends and gain courage through roller derby—a sport built to empower women. 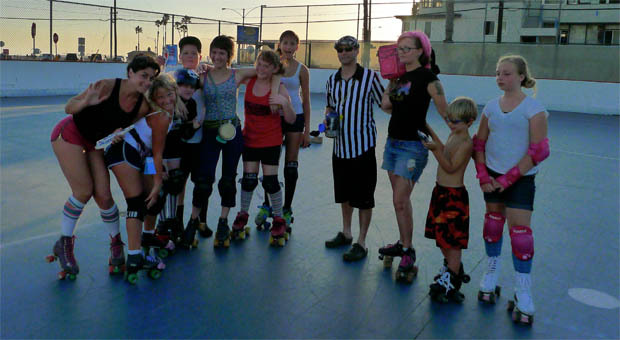 Founder and coach Michelle “Estro Jen” Steilen (who also owns the Moxi roller skate shop on 4th St. and helped start the Long Beach Derby Gals) is the epitome of encouragement for the group’s high school-aged girls, who through Junior Roller Derby learn the skills, teamwork and confidence necessary to one day join to the big leagues. Junior Roller Derby of Long Beach is currently recruiting for new skaters (girls) and junior referees (boys) and is hosting a night jam open skate this Thursday at the Queen Mary Dome. For more information, visit the league’s Facebook page or email [email protected].